Personalized health. Precision medicine. Dad. 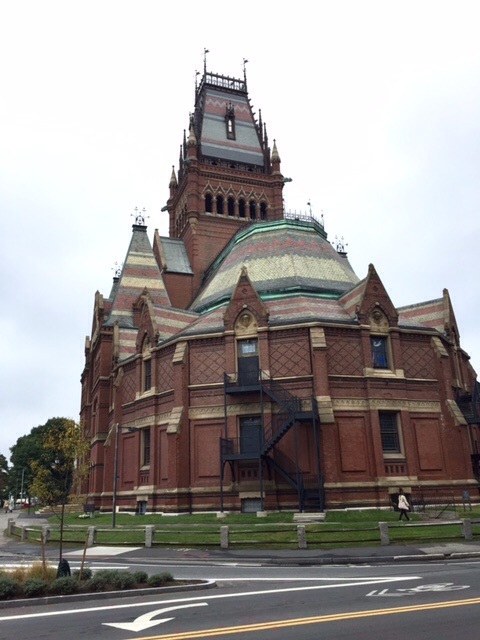 I recently presented results from our DIY genomics project at MindEx 2015 held at Harvard’s very Hogwarts-looking Sanders Theatre. Hosted by the Mind First Foundation, this conference enabled participants in the Personal Genome Project to hear first-hand how their health data could be used in research, especially mental health research. The second day of the conference, the “PGPalooza,” let PGP participants directly interact with researchers to select projects of interest and have their questions answered immediately. Also, special thanks to Alex Hoekstra, co-founder of Mind First, for the invitation to this event. This entry was posted in GenomeDad Blog and tagged autism, bioinformatics, crowdfunding, DIY genomics, DNA, experiment.com, family trio sequencing, genetics, genomics, health information, Open access, personalized medicine, precision medicine, WGS on September 27, 2015 by ktpickard. Yesterday, I presented preliminary findings at the 2015 Clinical Genome Conference in San Francisco from our family trio sequencing project. In this crowdsourced project on experiment.com, I looked for genetic clues to autism in our adult-aged daughter. While the talk focused on the “DIY” aspects of how to accomplish WGS sequencing (see slides), this post focuses on genetic findings. The project began with a crowdsourced effort to raise $1,750 to sequence our daughter’s genome, and took slightly more than two months to complete. 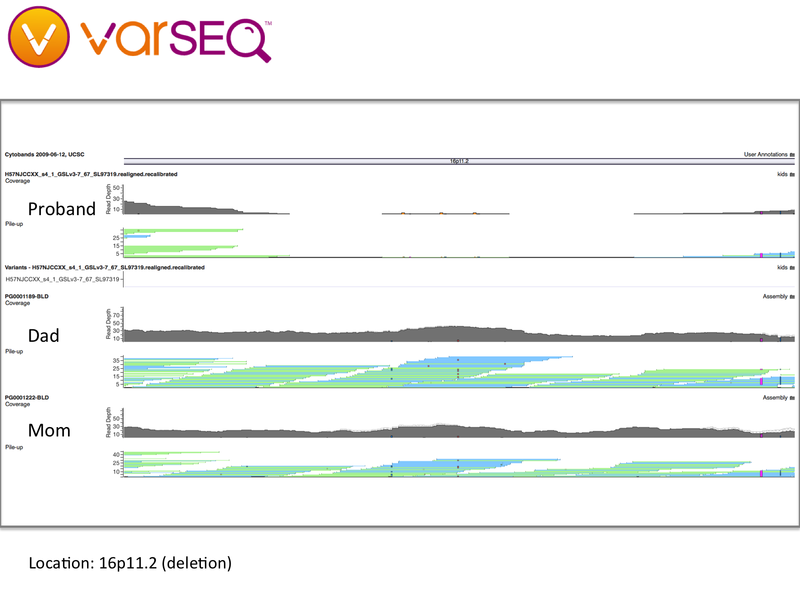 After working with AllSeq and HudsonAlpha to obtain WGS data, we used VarSeq from Golden Helix to search for unique variants, as well as browse whole genome sequence data. 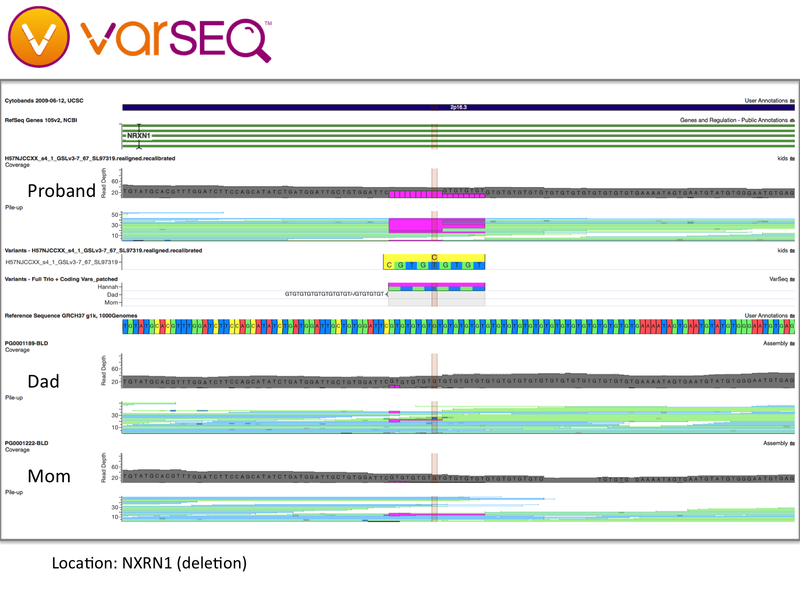 After filtering our variant call data to focus on high quality exome variants, we examined 52 potentially damaging de novo and compound heterozygous changes suggested by VarSeq’s family trio analysis. Although this first approach did not yield clues specific to autism, it did suggest a number of secondary findings that are not addressed here. The second approach was to start with genes having known associations with autism and then look for them in our daughter’s DNA. Several curated databases have between 200 and 700 genes, but again, none produced meaningful results. The third method was to look at known “hot spots” in autism genetics, such as variants in the NRXN1 gene, as well as known structural variation on chromosome 16. Changes to NRXN1 and so-called “16p” changes are discussed below. NRXN1 – Deletions in NRXN1 are associated with a wide spectrum of developmental disorders, including autism. Our daughter has a 10bp exonic deletion (-GT repeat) followed by what appears to be a 9bp compound heterozygous deletion in NRXN1. Both deletions are partially present in both parents and overlap; the deletions appear to have been accumulatively inherited. Due to the high number of sequence repeats, copy number variation (CNV) should clarify the significance of this finding. 16p deletions – Deletions and duplications in this 593-kilobase section of chromosome 16 are widely associated with developmental issues, including autism. Our daughter appears to have dozens of deletions in this region, some inherited and some not. However, since the variants in our daughter’s DNA were called using a different software pipeline, it is difficult to draw meaningful conclusions (see “Limitations,” below). For example, some variants in our daughter’s DNA were shown to map to multiple places on the genome, suggesting either large copy number variation or genomic regions that were difficult to map. Copy number variation (CNV) analysis will also elucidate this region. Once resequenced, this region has the potential to provide genetic clues to our daughter’s condition. My wife and I received our WGS data in March 2014. Our samples were sequenced at 30x coverage using Illumina’s HiSeq platform and then aligned and called with Illumina’s pipeline, Isaac. Our daughter’s DNA was sequenced in May 2015 at 30x coverage, but on Illumina’s newest platform, the Illumina HiSeq X Ten. The difference is that our daughter’s DNA was aligned using BWA, followed by variant calling with GATK “best practice” workflow. To accurately compare genomes in family trio analysis, all samples must be processed using the same software pipeline. Otherwise, variants may be aligned and called differently. My wife and I must go back to the (almost) original FASTQ data and start over. Although Illumina did not provide these files with our results, Mike Lin from DNAnexus explains how to extract FASTQ files from Illumina data in this great blog series. Hint: it involves a utility called Picard (no relation). Until we resequence our WGS data using the same bioinformatics pipeline, all results should be considered preliminary. This project demonstrated that personal genomics is very real, and has the potential to answer complex medical questions. Today, answering those questions using whole genome data and family trio analysis requires a combination of genetic, bioinformatic and domain knowledge to reach meaningful conclusions. Validating those conclusions remains challenging, from rare diseases to complex conditions such as autism. Currently, personal genomics has a similar feel to “homebrew” computer clubs from the late ’70s–the community is still very small, collegial, and willing to share “tips and tricks” to advance the field. Although we encountered some “dark alleys” during the analysis, our preliminary results suggest that family trio sequencing can indeed provide genetic clues to autism. We will continue to refine the analysis by resequencing the data with the same pipeline, which should resolve questions in the 16p region, as well as the potential deletion in NRXN1. Further, CNV analysis should answer structural variation questions that are also known to be associated with autism spectrum conditions. I would like to thank our backers and the team at experiment.com, as well as Gabe Rudy from Golden Helix. Gabe was very generous with his time, knowledge and insight. Finally, I would like to thank my wife, Kimberly, for her patience and fortitude. This entry was posted in GenomeDad Blog and tagged autism, bioinformatics, crowdfunding, DNA, experiment.com, family trio sequencing, genetics, genomics, Golden Helix, Illumina, Open access, VarSeq, WGS on June 24, 2015 by ktpickard. This entry was cross-posted from DNAdigest on April 22, 2015. Amazingly, the cost of whole genome sequencing is now 100,000 times less expensive than it was a dozen years ago. If the Tesla Model S followed this trajectory, you could buy one today for less than $1 USD. This super logarithmic decline puts genomics on par with desktop publishing or 3D printing—it has become something that you can affordably do yourself. My wife, Kimberly, and I were excited about the prospect of having our genomes sequenced. Our daughter has autism, and like many parents of special needs children, we were eager to explore the underlying causes of her condition. We “got genomed” last year by enrolling in Illumina’s Understand Your Genome program. We received our whole genome sequencing (WGS) data, as well as limited predisposition and carrier screening for a number of Mendelian traits. As many DNAdigest readers know, the cost of WGS continues to drop in price, almost to the $1,000 genome that Illumina announced last year. Kimberly and I were intrigued to learn that we were both carriers of some rare genetic variants. Could our genetic idiosyncrasies be contributing to our daughter’s autism? After being sequenced, I followed the lead of DNAdigest contributor Manuel Corpas and posted my whole genome sequence online. I decided to publish my genome without restrictions in an attempt to lead by example. In the future, platforms like Repositive will make it easier for consumers to share genomic information and maintain privacy. Kimberly and I recently launched a project on experiment.com to crowd fund the whole genome sequencing of our adult-aged daughter. In this project, we will look for genetic clues to her autism using family trio sequencing. Family trio sequencing is a powerful technique that can explain genetic conditions by looking at differences in DNA between Mom, Dad and an affected child. We were thrilled when the sequencing project was funded the first day. In the process, we received feedback from other parents who wanted to learn more about the technique, so we added a stretch goal to cover publishing costs in an open access journal. The research paper will document our findings, as well as explain how family trio sequencing can be used to search for answers to health conditions and rare diseases. Information sharing can indeed be very personal, but we find the possibility of catalyzing new areas of health research compelling. With this project, we hope to find clues that will contribute, if only in a small way, to a growing body of genomics research that supports a broader explanation of autism. This entry was posted in GenomeDad Blog and tagged autism, bioinformatics, crowdfunding, DNA, DNAdigest, experiment.com, family trio sequencing, genetics, genomics, Illumina, Open access, WGS on April 22, 2015 by ktpickard. I uploaded my whole genome sequence data to the cloud. 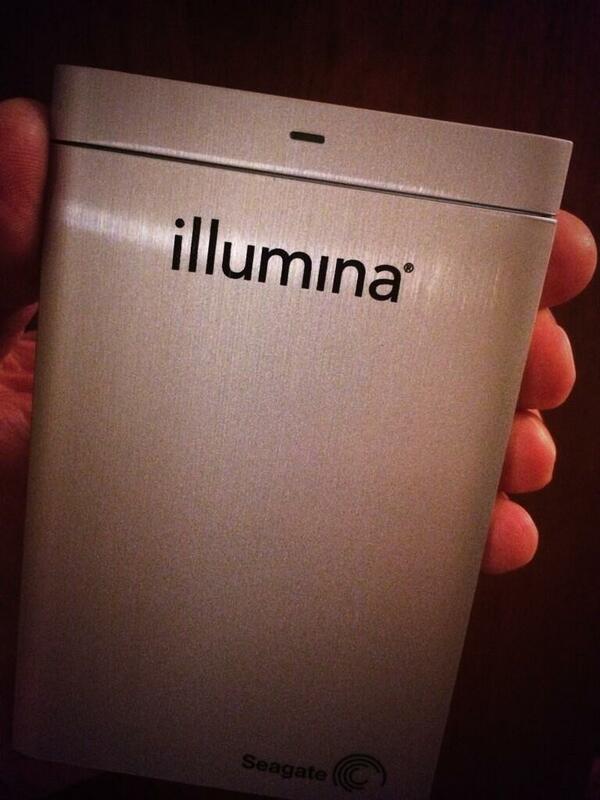 I got genomed by Illumina. In March 2014, my wife and I “got genomed” by enrolling in Illumina’s Understand Your Genome (UYG) program. UYG requires participants to order this whole genome sequence (WGS) test from their physicians due to uncertainties surrounding the delivery of genomic results in the U.S. Illumina is careful to point out that the service “…has not been cleared or approved by the U.S. Food and Drug Administration” and “you will not receive medical results, or a diagnosis, or a recommendation for treatment.” Our family physician signed the request in November 2013, and we received our results in February. Fortunately, no surprises, but the UYG program only covers these Mendelian disorders for now. We flew to San Diego a few weeks later to listen to talks by genomic researchers and discuss our results with genetic counselors. As part of this one-day seminar, we each received an iPad Mini that was pre-loaded with our results, as well as a portable hard drive that contained our raw sequence data. I received my WGS data on this encrypted hard drive (about 100GB). After we arrived home, the next step was to find a public “home” for my sequence data (to share without restrictions). What I learned is that uploading your genome anywhere is a challenge, mostly because the dataset is so big. My genome data and results are now in the public domain, freely available to download under a Creative Commons (CC0) license. Uploading the data took two days over a 3Mbps connection, so you may want to read the clinical report and sample report instead. Questions about FTP? See this FAQ. Now that I have my genome in the cloud, I’ll start playing with analysis tools like STORMSeq. Stay tuned! This entry was posted in GenomeDad Blog and tagged AWS, DNA, EBS, EC2, FTP, genomics, Illumina, Open access, personalized medicine, S3, WGS on September 28, 2014 by ktpickard. Summary: Participatory medicine flourishes where there is an unimpeded flow of information. Open and freely available access to medical research improves outcomes and empowers e-patients. Traditionally, research papers undergo peer review before publication. Two trends, open access and social media, are changing the peer review process. I wrote this article to learn more about the peer review process. Since the article was peer-reviewed, I learned more than I expected. The article was recently published in the Journal of Participatory Medicine. This entry was posted in GenomeDad Blog and tagged e-patients, Open access, participatory medicine, peer review, social media on July 21, 2012 by ktpickard.